The 14504 Compact Excavator completing the Wacker Neuson product range of the compact track excavators. 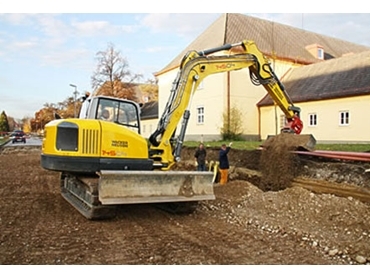 The compact excavator is a 14t class model and the strongest machine in the range. The machine features a tail swing console that provides flexible deployment even in restricted spaces. Each model in the 14504 series is fitted with a dozer blade as standard and is available with three track types that include rubber, steel and hybrid. Despite weighing 14tonnes the 14504 Compact Excavator demonstrates outstanding stability due to optimal weight distribution and is easy to both manoeuvre and handle. The 14504 Compact Excavator features high performance hydraulics that enable spontaneous actuation of the hydraulic functions and maximum working speed. Hydraulic performance can also be adapted to specific working situations. The Wacker Neuson 14504 is suitable for a range of applications that include surface construction, civil engineering, quarrying, demolition and rubble handling, waste disposal, forestry and farming.